All shelter dogs have their own story about how they ended up behind the bars of a cold kennel. But while nothing can rewrite their pasts, one little boy is working to give hope to their future. Best of all, by opening his heart to these animals, he's learned to overcome his own challenges. 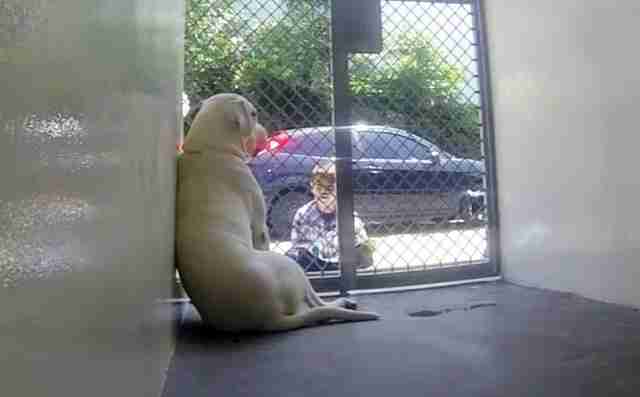 For more than a year, 6-year-old Jacob has spent every Thursday after school visiting with lonely dogs at the Carson Animal Shelter in Los Angeles. There, with book in hand, he finds a place in front of their kennels and reads them stories. The simple gesture has a profound affect on the shy and anxious animals, teaching them that it's OK to come out of their shells and show their sweet personalities - thereby improving their chances of catching the attention of adopters. "He loves it," Jacob's mother, Katherine Tumalan, tells The Dodo. "The dogs get so in tune with him. They might be barking and going crazy, but when Jacob reads to them, they become calm and focused, their tails wagging." But dogs aren't the only ones reaping the benefits from Jacob's act of kindness, seen here in a video from NBC Los Angeles. When he was younger, Jacob was diagnosed with autism, which makes him particularly sensitive to loud noises. Having spent so much time at the shelter, reading amid the sound of barking dogs, he's now better able to work through such distractions every day. "Sometimes, loud noises used to make him cry or act out," Tumalan says. "But now, he's focused. He's learned to not let all the noises around him bother him. It's pretty awesome." That, plus the fact that he's getting all that practice reading, has improved Jacob's overall performance as a student. "It's been a huge thing. He's come a long way," says Tumalan. "I just got a report that my son is reading at almost a thrid-grade level now. It's really helped him, and the dogs too."